Can you help this cricket tragic? The Johnny Martin Testimonial & Oval Naming at Taree Park, 1989. There’s a book about 100 years of cricket in the Manning Valley on its way, and the foreword says “Les Eastaway has Manning water in his veins, not just blood”. Les Eastaway grew up in Taree, and his grandfather spent his life in the Manning. His father, too – Henry Murray Eastaway – was a seafarer known as Captain Eastaway. Before retirement was a Pilot-Snr. Officer on the Electra and Rosedale Sydney-Manning run. Les lived for 30 years in Sydney where he operated a busy commercial milk run, and says he always missed the Manning. A passion for cricket began for Les Eastaway in the 1960-61 Aust/West Indies – and Johnny and the fellow Martin cricketers. They all feature in the book – Les has already amassed pen portraits of about 80 cricketers going back 100 years. Les says he is writing the book and using his collection of photographs because of his pride in the Manning district. However Les is still searching for some information. He is looking for an EL Martin Shield for Inter-District Cricket between Hastings, Manning, Kempsey and in the early years 1950 to 1961 Dungog. Dungog won the first two in 1949-50 and 50-51. He is missing winners from 1951-52 till 1960-61. It was a rosewood shield and may have miniature shields depicting yearly winners. At one stage the Shield was on display in the Bank Hotel at Dungog. The Mid North Coast Cricket Council only have about ten winners so they shall be well placed when the story is completed. Les says there are many wonderful players and characters in the book who have never been highlighted before. Growing up in Taree and attending Taree High Les was immersed in sport – cricket, tennis, hockey and surfing among them. He notices with regret so many young people these days prefer video games and smart phones. Les Eastaway has been working on his book for more than 4 years, and full time since his retirement to Inverell two years ago. It’ll be finished soon he says. Many of us can’t wait. If you can assist Les, please email him. 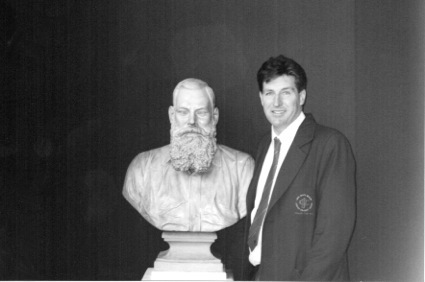 Les Eastman at Lords Museum, London, with a bust of WG Grace.